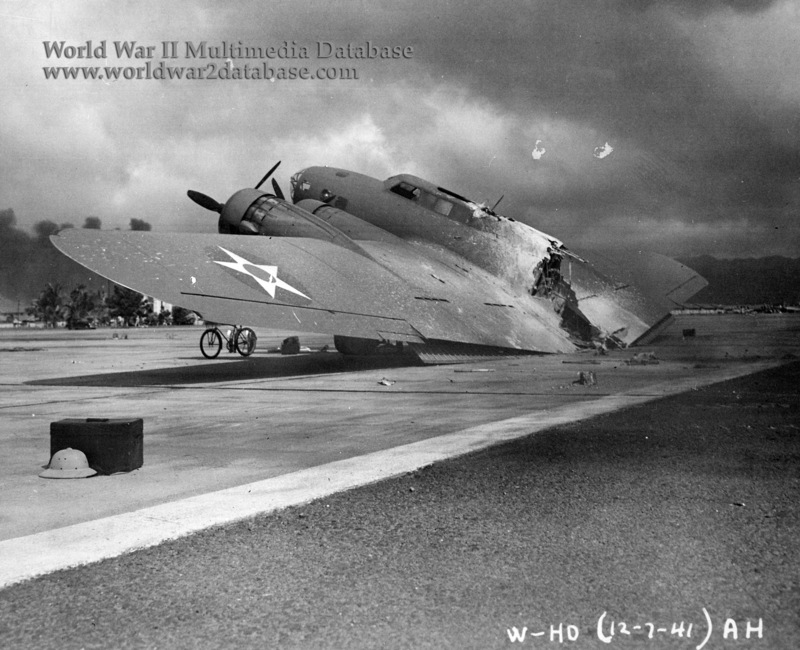 Wrecked Army Air Corps B-17C (serial 40-2074) Flying Fortress of 38th Reconnaissance Squadron near Hangar 5 at Hickam Air Field, following the end of the Japanese raid. This plane, piloted by Captain Raymond T. Swenson, was one of those that arrived during the raid. It had been the second plane to take off from Hamilton Field, San Rafael, California the previous evening, was now rounding Diamond Head and preparing to land at Hickam. Second Lieutenant Ernest Reid, the co-pilot, was anxious to be on the ground. The whole crew was badly in need of a brief rest after the long flight, and all were looking forward to an afternoon on the sunny beaches of Waikiki. First Lieutenant William R. Schick, the flight surgeon, watched the big island spread out below him from his passenger seat in the aircraft. Second Lieutenant H. R. Taylor, the navigator, was snapping photographs, though he was somewhat mystified by the early morning fireworks he saw in the distance. Captain Swenson assumed the locals were burning sugarcane. He was still unaware of the battle that raged below. The landing gear was lowered and his B-17 dropped to 600 feet for final approach before the crew got a good look at the airfield, now fully under attack. Japanese Zeroes zoomed in to rake the inbound Flying Fortress with a stream of tracers. It was too late to pull up and abort, so the pilot steeled himself against the looming inferno and stayed on course. To the rear Lieutenant Schick cried out, "Damn it! Those are real bullets they're shooting. I'm hit in the leg." The incendiaries ignited the magnesium flares on the plane and they burned furiously. Smoke filled the cockpit as the B-17C dropped earthward, and then hit hard on what was left of the runway. The big bomber broke completely in half. In that moment Captain Swenson's B-17 gained the dubious distinction of being the first American airplane to be shot down in World War II. Lieutenant Masanobu Ibusuki and Lieutenant Commander Shigeru Itaya claimed credit for the B-17C. The nine crewmen scrambled for safety and Lt. Schick was shot in the head by a A6M2 Zero-Sen. Four others were wounded. Swenson and Reid set the parking brakes and shut down the engines on the burning aircraft. Note bicycle parked by the plane. Pith helmet by the case in the left foreground indicates that the photographer was Tai Sing Loo.